There are basically two reasons why auto manufacturers still put a stick shift into a vehicle. It can be a slick, well-tuned unit to make it more engaging for enthusiasts, which usually goes on a more expensive model, or it’ll be a slushy, long-throw cheapie so the ads can trumpet the lowest possible price. While it more than keeps up with everything else, it doesn’t feel all that quick when accelerating off the line. That’s not a bad thing, though: instead, it feels light, smooth, and delightfully balanced. So it’s unusual when something actually combines price and performance, but Mazda actually pulls it off. 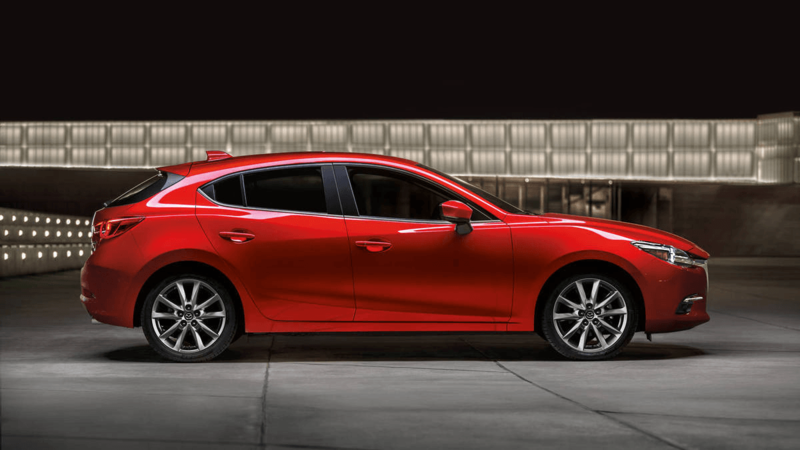 In this article by Pfaff Mazda, we will be going over some of the features of the Mazda 3 GT 2018. In terms of styling, the 2018 edition stays virtually the same as the 2017, which had gotten a light redesign; but it’s worth noting that the basic design of the Mazda 3 GT is now four years old, and still others are struggling to catch up. It is probably the prettiest, most well-proportioned model in its category. Its look is athletic without appearing like it’s trying hard to be. The front end tapers pleasingly to the nose without the whole thing being too “pointy”, and the lines stretch back from there in sleek fashion, along the long hood through to the rounded back end. Mazda engineers managed to make this front-wheel drive car look like a rear-wheel drive, and the 2018 Mazda 3 GT sedan is all the better for it. The overall effect is of simple lines, really well drawn. As well put-together the Mazda 3 GT is on the outside and in the cabin, so it is in its guts. The Grand Touring, like the Touring, gets the bigger of the two available engines for the model, a 184-hp 2.5L SKYACTIV-G 4-cylinder that delivers 185 lb-ft of torque. A manual gearbox is, surprisingly, these days, the default transmission for all three versions of the Mazda 3 GT, but my GT tester had the SKYACTIV-DRIVE automatic. Mazda manages to make the interior of the 2018 Mazda 3 GT a driver-focused environment without imprisoning said driver in an overly claustrophobic cocoon of a space. Which means, leg-, elbow- and shoulder-space are ample enough, and the instrument cluster behind the steering wheel doesn’t encroach out and down from where it’s meant to be. The Grand Touring version comes with a mighty fine 9-speaker Bose audio system, dual-zone climate control, a colour head-up display, and a regulation-size moon roof. For more information about the 2018 Mazda 3 GT, we encourage you to visit our Pfaff Mazda website, or visit our dealership today! Click here to find our contact information, schedule a test drive, or to fill out our contact form.